Lepidium chalepense (lens-podded whitetop) is a perennial (family Brassicaceae) that is relatively infrequent in California. 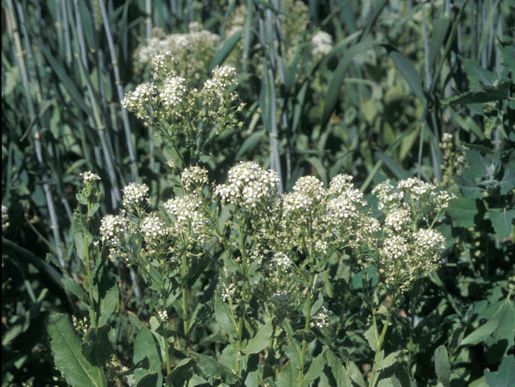 Lepidium draba (hoary cress) and L. chalepense grow in the many habitats and areas of the state, except in the Mojave and Colorado deserts. However, L. draba occurs in wet and dry grasslands, scrubs, and arid areas with alkali soils and is much more common than lens-podded whitetop. Lepidium draba establishes monospecific mats that exclude most or all other herbaceous vegetation. L. chalepense forms dense infestations that crowd out forage plants in meadows and fields.